Latourrette Consulting is pleased to announce a new business meeting between partners and prospects in Latin America, now for the first time in Colombia, on November 22nd at the Hotel TRYP Wyndham Embajada, in Bogota. After the success of the business meeting in São Paulo, Brazil Latourrette Consulting is now, for the first time, organizing a dedicated day to partners and clients in Colombia. 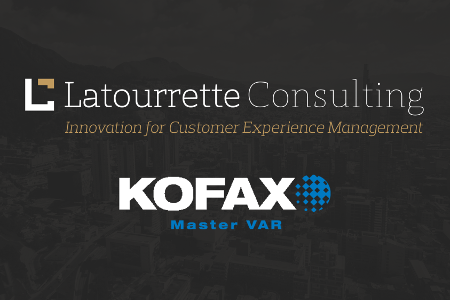 In this opportunity, the company will announce its partnership as Master VAR of Kofax with several presentations to be realized by international specialists of the two companies that will address the newest services and opportunities available to partners and their clients throughout Latin America, as well as presenting special conditions offered by the Latourrette Consulting and Kofax partnership. This event will also be a great networking opportunity for Kofax partners and potential clients to meet, and share experience and knowledge. The event starts will be starting at 9:30 am (local time) and is scheduled to end at 5:00 p.m. If you wish to be present, please contact us by email. Contact us for more information about Kofax solutions. Latourrette Consulting is a Certified Kofax Partner in Portugal/Brasil/Colombia/Chile/USA/España/Nederland.